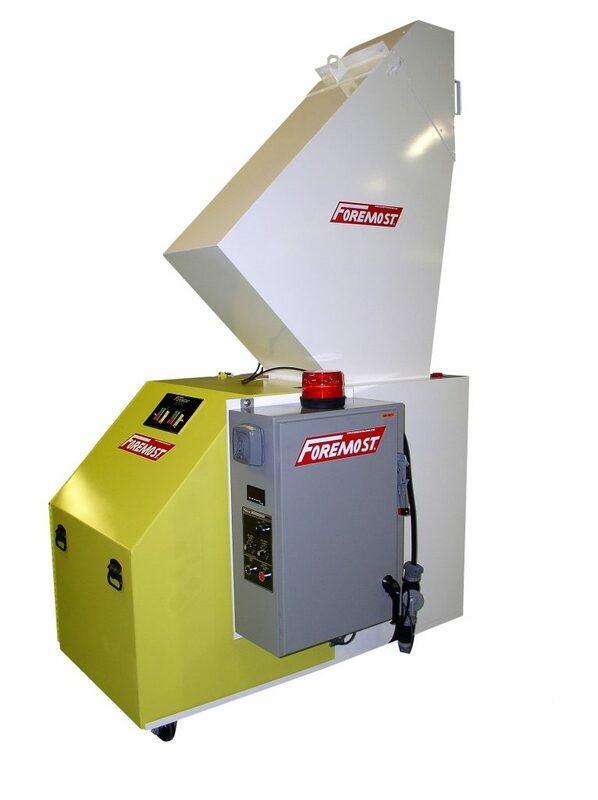 FUTURA Quiet Granulators – QG-1410 – Foremost Machine Builders, Inc. The Foremost QG-1410, with 40% more throat area than the Model 1010, retains that model’s slim profile, with the same two foot width. Along with the usual sprues and runners, this size can accommodate large reject parts, such as gallon bottles. Note: This machine is not designed to granulate large purgings. For this application, request information on our patented Dual-Stage Grinders. 7.5 or 15 HP dripproof motor, 1800 RPM. Quick conversion from 230 to 460 volt operation. Operator station with 120 volt controls oil-tight controls, wired complete and including grinder running light. Two hook-type skewed rotary knives, and two counter-skewed adjustable bed knives. Note: Specifications for reference only. Output and sound levels vary according to the nature and form of the product. Actual throughput can be determined from a trial run of your material at Foremostâ€™s test facility. Typical Output: 250-450 lbs. per hour. Sound levels: 66 dBA (idling), 74 dBA (grinding). Power requirements: Under 10 amps @ 460 volts (7.5HP). Under 20 amps @ 460 volts (15HP).